The confluence for this Worldcon was too good to ignore: end of the summer, a chance to visit Scandinavia (and my extended family) again, and close enough to a significant birthday to justify rationalize the expensive. Planning began in December, when I put together a spreadsheet to maximize my vacation following the adventures of the medial sinus. We found a really great deal* for flights on KLM with connections in Linköping, Sweden, close to several of my relatives. PSA: I love Norwegian Airlines due to their newer aircraft, friendly staff, and connections from Oakland to Stockholm. They will get ALL my future business if possible. KLM/Delta can kiss my wrinkled hiney. The people – a goodly number of the tribe managed to show up, and the Finnish fans were passionate. The setting: Helsinki is a cool place. As I have noted elsewhere, it’s a lot like Stockholm if you added extra vowels. The GOH – Walter Jon Williams – was his usual bon vivant self, and taught a very appreciative crowd much about his Finnish ancestors and their adventures in Duluth, MN. 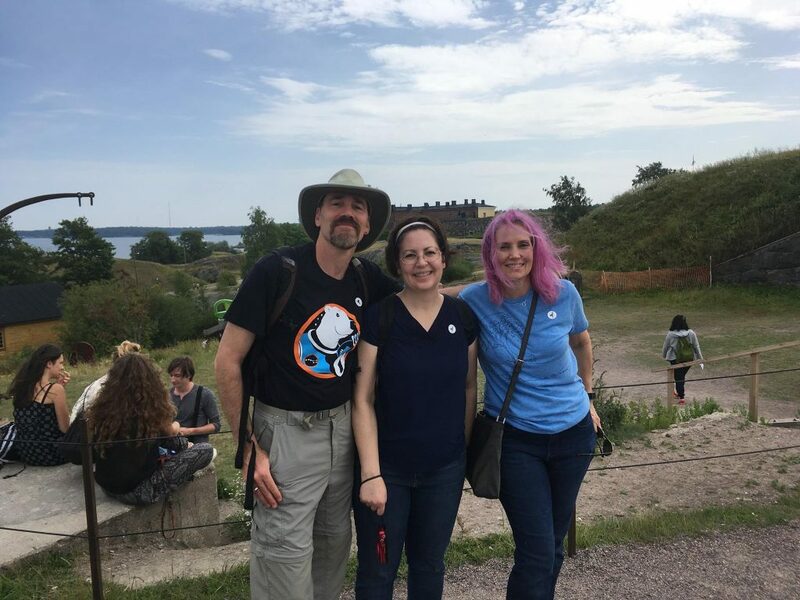 A very cool side trip to the sea fortress of Suomenlinna. Sauna. Even the modest hotel saunas were very comfortable. Meeting one of my editors from Fireside Fiction, the smart and sassy Julia Rios. Next year’s site: San Jose, California. And Dublin is the favorite for 2019! The Mad Max-inspired blacksmiths who plied their trade outside the convention center. Limited hotel space. The main hotel next to Messukeskus could only hold a fraction of the attendees, so people were spread out all over the city. It was nigh impossible to put together a decent bar con. All-night construction: due to enormous seasonal variations, most of the major building & road construction occurs in the summer. That meant they were breaking ground and pouring concrete for the new shopping mall next to my hotel every day until 4 am. Socialist work hours: most of the restaurants in the convention center closed by 7, or even 6. And those that were open had queues all the bloody time just to get a cup of tea or an overpriced sandwich. Tiny meeting rooms. If you weren’t in line 15-20 minutes before, you didn’t get a seat. After the second day, the organizers realized their error and negotiated for larger spaces in the basement. With air conditioning!